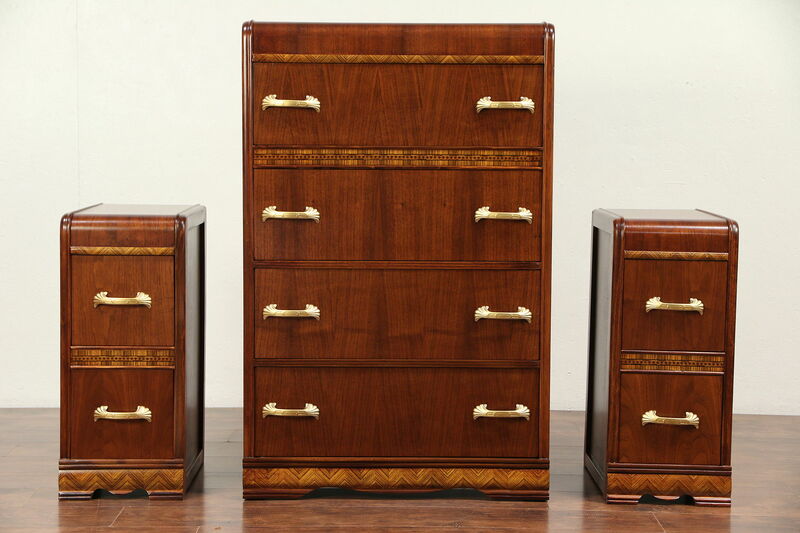 A "waterfall" design bedroom set includes a highboy or tall chest plus two nightstands from the late 1930's. Walnut and mahogany with inlaid banding, no maker's signature survives. The restored finish is in excellent condition, preserving just enough shrinkage separations and mars at the edges for a little character. Original pulls are refinished on this American made vintage furniture. Large drawers have solid oak sides with dovetail joints and original pulls. Chest size is 30" wide, 18" deep and 47" tall. Nightstands are 12" wide, 18" deep and 28 1/2" tall.